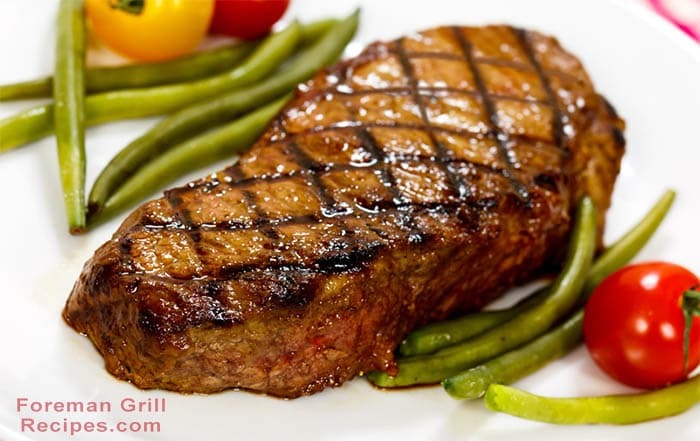 New York Strip Steak is delicious and easy to make on your George Foreman Grill. You can make a juicy and tender steak in very little time that will be bursting with flavor! New York Strip is known for being an excellent cut of steak with lots of flavor and this recipe will will give you the perfect steak with easy. No need to fire up the grill outside just to have a great steak. Make it inside right on your Foreman Grill! Pound steak to be 1/2″ – 3/4″ thick with a meat mallet. Place in glass baking dish and add Worcestershire sauce, red wine vinegar, onion powder and rosemary. Let marinate for about an hour in the refrigerator. Place steak on a plate and pour the marinade over the steak. Use a sharp knife and cut about 10 small slits in the meat and place pieces of the garlic into the slits. Brush with olive oil and sprinkle fresh ground pepper and salt over steak. Preheat your Foreman Grill for at least 5 minutes with the lid closed. Use high setting if your grill has it. Grill the steak for about 4-5 minutes with the lid closed for medium-rare.